The Homeric Hymns have survived for two and a half millennia because of their captivating stories, beautiful language, and religious significance. Well before the advent of writing in Greece, they were performed by traveling bards at religious events, competitions, banquets, and festivals. These thirty-four poems invoking and celebrating the gods of ancient Greece raise questions that humanity still struggles with—questions about our place among others and in the world. Known as “Homeric” because they were composed in the same meter, dialect, and style as Homer’s Iliad and Odyssey, these hymns were created to be sung aloud. In this superb translation by Diane J. Rayor, which deftly combines accuracy and poetry, the ancient music of the hymns comes alive for the modern reader. Here is the birth of Apollo, god of prophecy, healing, and music and founder of Delphi, the most famous oracular shrine in ancient Greece. Here is Zeus, inflicting upon Aphrodite her own mighty power to cause gods to mate with humans, and here is Demeter rescuing her daughter Persephone from the underworld and initiating the rites of the Eleusinian Mysteries. This updated edition incorporates twenty-eight new lines in the first Hymn to Dionysos, along with expanded notes, a new preface, and an enhanced bibliography. 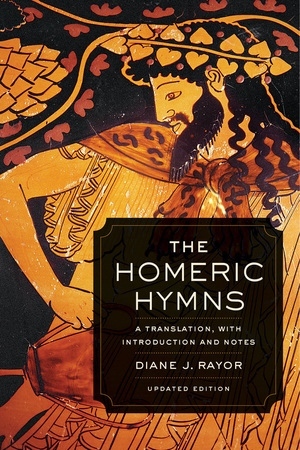 With her introduction and notes, Rayor places the hymns in their historical and aesthetic context, providing the information needed to read, interpret, and fully appreciate these literary windows on an ancient world. As introductions to the Greek gods, entrancing stories, exquisite poetry, and early literary records of key religious rituals and sites, the Homeric Hymns should be read by any student of mythology, classical literature, ancient religion, women in antiquity, or the Greek language. Diane J. Rayor is Professor of Classics at Grand Valley State University, Michigan, in the department she helped found. In 2011, she received the prestigious Glenn A. Niemeyer Outstanding Faculty Award for excellence in teaching, scholarship, and service. Her translations of ancient Greek poetry and drama include Euripides’ “Medea”; Sophocles’ “Antigone”; Sappho's Lyre: Archaic Lyric and Women Poets of Ancient Greece; and, with Stanley Lombardo, Callimachus. She also edited, with William Batstone, Latin Lyric and Elegiac Poetry.